All the citizens of the Empire will submit to the yoke of the Empire. 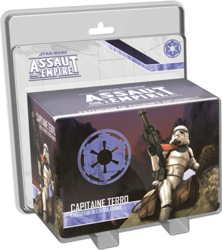 Bring a dose of tyrannical terror to your Assault on the Empire parties with Captain Terro, Executor of the Desolations. The "Patrol in Desolations" Project Cards series provides the Imperial Player with new options and a thrilling side mission that will fit into any campaign. This expansion also contains new Command Cards and two unique Skirmish missions to play one on one.